Are you planning a bathroom remodeling, but don't know how to start? We have put together a few tips that we always give to our clients to help you have a smooth and easy remodeling experience! Tip #1: What is the right bathroom for YOU? Use your imagination and think of your ideal bathroom. If you didn't have a budget limit, how would you that space be? Picture your dream bathroom and imagine it as a part of your daily routine. Do you have children, and how many people will share that space? Are you looking for functionally and an easy to clean space, or are aesthetics your main concern? Do you need a lot of storage, or is the space made for guests? Answering those questions will make creating a layout concept and even choosing the materials a lot easier. And we are not saying this because we are professionals and want you to hire us (although we'll be happy to help you if you do)! DIY is not always cheaper and it's definitely not a great idea if you don't know what you are doing. Depending on your house's age or state, simply updating the look without paying attention to the space's conditions might cause you problems down the road. For example, changing your floor tiles over old and damaged plumbing is only going to cover the problem and cause you more trouble down the road. If you are going to spend time and resources on a remodel, make sure that you are doing everything right to avoid having to redo it (and spend more) later! Set up a realistic budget and know how flexible you are willing to be. Would you let go of some of your must-haves in order to stay within your limit amount, or are you willing to spend a bit more if necessary to get exactly what you want? A bathroom remodel can cost anything between $5,000 to $100,000 and up depending on the complexity of the remodel, the materials and finishes. 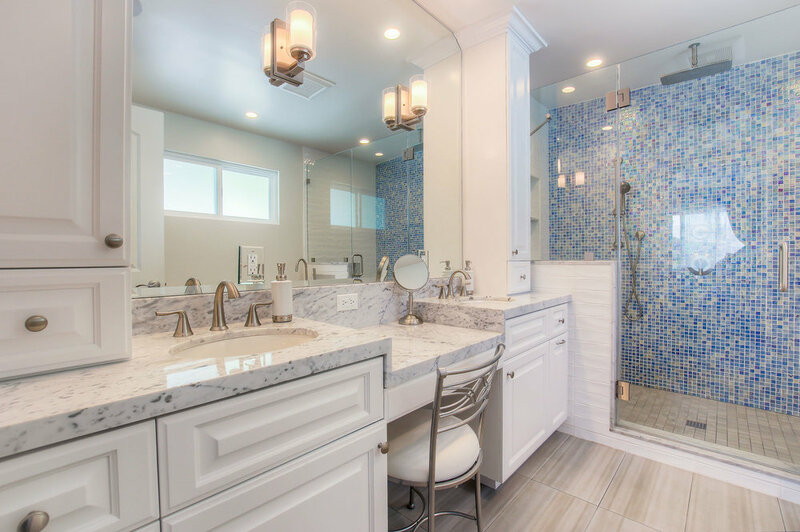 The average spend for a homeowner doing a basic master bathroom remodel is between $8,000 - $10,000, and between $15,000 - $20,000 for a complete remodel, but that number can vary a lot depending on what you are trying to accomplish. Modern spa master bathroom in West LA. Now that you know your budget and your needs, find out what your priorities are and what you are willing to let go to avoid going over your budged. One of the suggestions we give to our clients is to save in finishes if you need to spend more in the design, such as changing the layout or adding extra space. Using premade cabinetry or choosing porcelain tiles rather than natural stone for floors and countertops can save you a lot of money and still give your bathroom the same look you want . You can even do a wood or concrete look with porcelain tile, for example! Traditional master bathroom in Sherman Oaks. Are you ready to start building the bathroom of your dreams? We are always happy to answer all your questions, just send as a little message or comment below!